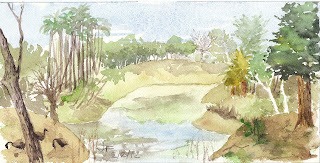 On Thursday I went out to Overfelt Gardens is East San José with the SCVWS Plein Air group. Due to alarm clock issues, I was late and only had time to do a quick small painting of the pond. The ducks and Canada geese were busy and noisy, as always. This piece was done on a 6" x 12" Arches cold pressed block. As usual, my water doesn't look very wet, which is kind of ironic, as it took forever for ther paper to dry! Nice little piece, Janice. I feel like I am sitting there right now looking at your painting. Hi Janice, Nice landscape, there's alot of details here and was fun exploring it. All the trees are great!